We are now in the later part of the month of July, this is always a warm time of year, very humid, muggy, days are long and tropical weather can rapidly change overnight. Crowds are a bit below average this month, perhaps the great fishing now being found off of Sothern California is a factor, as many anglers are taking advantage of their local bite, where yellowtail, bluefin tuna, yellowfin tuna and yellowtail are all providing epic action. This past week the highlight for the San Jose del Cabo sportfishing fleet was the yellowfin tuna bite that developed north of Vinormama, some 20 to 25 miles north of Puerto Los CabosMarina, a bit further than what normal panga or local cruiser charters travel on a regular basis. We could see fuel surcharges soon, if this continues. This is the same fishing grounds where the East Cape fleet has been concentrated on and they are located closer to these grounds than Cabo fleets. The key has been the availability of live sardinas, which are being found schooling near LosFrailes. 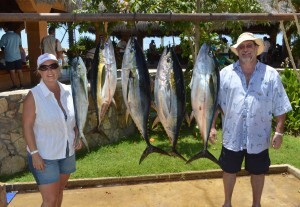 Anglers were drift fishing with these baits and hooking into yellowfin tuna in the 25 to 45 lb. class. This area where the fleet is finding these fish is very close to shore, so close that triggerfish are thick and skipjack are also out numbering the tuna. With persistence and the proper baitfish, charters were able to land, one to five of these yellowfin per morning. Rigging withforty pound main line spliced to 40 or 50 lb. fluorocarbon leader material has been the most productive technique. Dorado have been found more spread out, the majority being juvenile sized fish, but there are some much larger fish mixed in, bulls weighing up to 50 lb. were reported, though no big numbers, trolling larger baitfish such as bolito was one method than was producing alarger grade of dorado. Open water trolling saw a mix ofbillfish, actually last week there was sailfish, striped, black and blue marlin caught from local waters, again no big numbers, but these gamefish are present and an offshore grand slam could happen on any given day. This entry was posted in cabo, Fish Reports, Gordo Banks Pangas, los cabos, San Jose del Cabo, sportfishing on July 28, 2014 by admin.